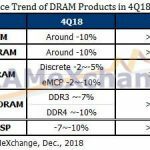 Demand for LCD panels from South Korean and Chinese TV makers is forecast to slowdown in the first quarter of 2018, according to market analysts. Slower demand is attributed to a traditionally slow season at the start of a new year and some demand pulled into the fourth quarter of 2017 to prepare for holiday and promotional sales, according to IHS Markit. “Panel purchasing strategies for the first quarter of 2018 may result in a correction as demand expectations change,” according to IHS. “It is estimated that the Chinese brands carried relatively higher level of inventories as of the end of December 2017 as they have been preparing for the upcoming promotional seasons in early January and the Chinese New Year holidays in February. 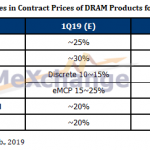 Given this, they are in no rush to secure more panel supplies in the first quarter, and may want to negotiate for lower prices,” said Deborah Yang, director of display supply chain at IHS Markit, in a statement. 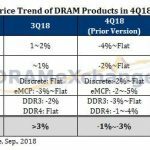 The latest IHS TV Display & OEM Intelligence Service report indicates that South Korean TV makers are expected to reduce LCD panel purchasing volumes by three percent in the first quarter of 2018 compared to the previous quarter, or to increase by one percent compared to the same period last year. WitsView, a division of TrendForce, reports “there was a 20- to 40-percent downward correction in TV panel prices during 2017. The price decline is expected to ease during the first half of 2018 with a gradual downward price trend in the first quarter. 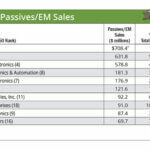 Analysts forecast the supply and demand of TV panels will be more balanced toward the latter part of the year. WitsView expects the lower panel prices to drive end product promotions, pushing up stock-up demand from TV brands in the second half of 2018. 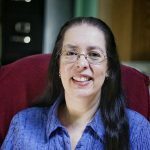 “Our latest analysis indicates that the risk of serious oversupply in the TV panel market will most likely happen later in 2019,” according to Anita Wang, senior research manager of WitsView, in a statement. 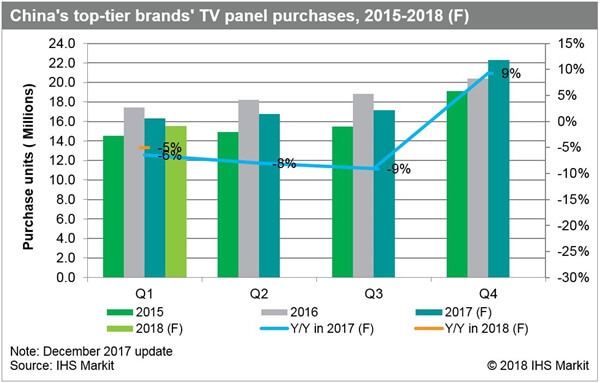 IHS forecasts that China’s top six TV makers -- ChangHong, Haier, Hisense, Konka, Skyworth and TCL -- will cut their LCD panel purchasing volumes by 30 percent in the first quarter of 2018 compared to the last quarter, and by five percent year-over-year. Yang believes during the “slow season” it will be a buyer’s market for large panel buyers. However, uncertainty about a stable supply for “feature-rich premium and larger panels” concern the top-tier TV brands. Two things are happening – the top-tier brands want to make sure they have sufficient supply of 65-inch and larger panels, but they also want lower pricing for these large panels, according to Yang. 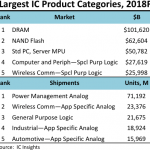 “Chinese panel makers have yet to prove that they will actually start mass-producing 65-inch LCD panels from the world’s first Gen 10.5 fabs in the first quarter,” she added. 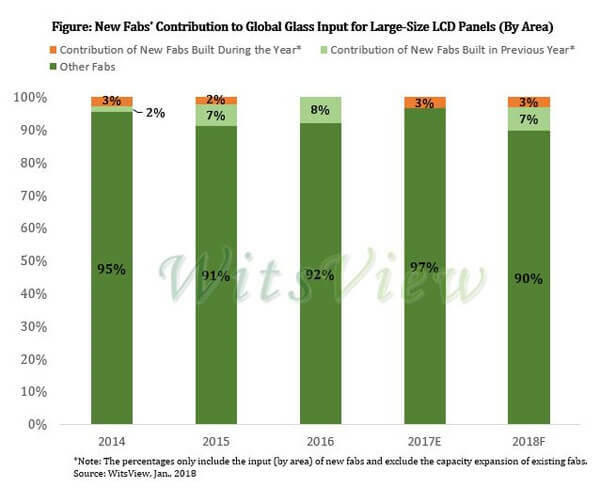 Yang expects scheduled fab remodels by some panel makers in the first quarter will result in an unstable supply for LCD TV panels, particularly for larger sizes. “All this points to the likelihood that the TV panel market will see chaotic swings in demand in the first quarter of 2018,” Yang said. 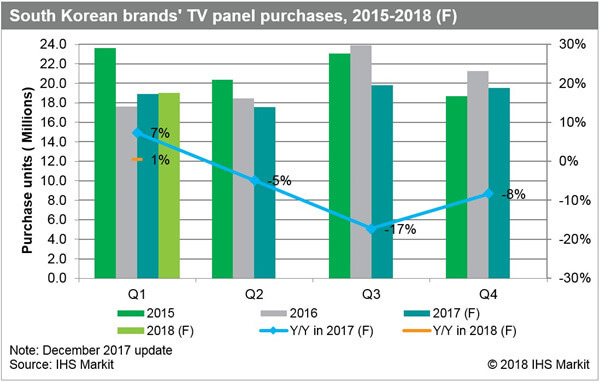 With several large generation fabs coming online in 2018, WitsView forecasts a supply and demand balance in the TV panel market this year as yield rates and production capacity increases. Wang said BOE has launched the industry’s first Gen 10.5 fab, and is expected to start mass production in March 2018, and CEC-CHOT’s Gen 8.6 fab and Gen 8.6+ fab of CEC-Panda Chengdu will start operation this year. BOE’s primary products will be large-size 65-inch UHD 60-Hz and 75-inch UHD 60-Hz TV panels while CEC’s new fabs will focus on 32- and 50-inch panels. Iris Hu, research manager of WitsView, believes that panel makers will continue to increase the production shares of large-size panels and UHD panels to boost their revenue and profits. “The penetration rate of UHD panels is expected to reach 42 percent this year, an increase of 7.4 percentage points compared with 2017,” said Hu, in a statement. However, Wang notes that BOE’s new fab capacity will be limited and will need time to improve the yield rate and production capacity. 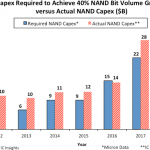 She estimates it will only contribute three percent of the global glass input for large-size LCD panels, rising to six to eight percent in 2019. WitsView’s estimates put BOE’s production target at more than 2 million pieces for the production of 65-inch panels, depending on the yield rate, rising to about three to four million pieces in 2019. Hu expects BOE’s shipments of 65-inch panels to surpass panel makers in South Korea in 2020, reaching a market share of about 37 percent. Market share of Taiwanese panel makers for 65-inch panels is forecast to drop to 18 percent. LG Display (LGD) retains its position as the top LCD TV panel supplier in 2017, increasing the production capacity share of its large panels, followed by BOE, Innolux, Samsung Display (SDC), China Star Optoelectronics Technology (CSOT), and AU Optronics (AUO). BOE’s total shipments reached second place for the first time, in part due to SDC’s closure of its L7-1 fab, according to WitsView. However, Wu says SDC improved its capacity utilization by simplifying its product mix, and invested in production equipment of UHD and large-size panels to increase the value of its products. UHD panels accounted for 54.6 percent of all SDC’s products in 2017 and remained a major supplier of 55-, 65- and -75-inch panels.